I just realized today that my son’s summer vacation is almost over. It’s come and gone so fast, and I don’t feel like we’ve done enough stuff yet. So this weekend, we’re going to take him for the day to Daytona Beach. I love that you can drive on the beach there. It makes things so convenient. I don’t even have to unload the truck, we just leave the back hatch open and take things out as we need them. In celebration of this weekend beach trip, I wanted to make a beach themed cocktail with my new favorite rum, Blue Chair Bay. I first used this rum last month in my Sweet Gypsy Cocktail. In that cocktail I used the Banana flavor, and in today’s cocktail, I’m using the white rum. This new rum is inspired by the island lifestyle of multi-platinum singer-songwriter Kenny Chesney. He’s poured his heart and soul into every step of the creation of this rum, from beach to bottle, and it shows. Blue Chair Bay is available in four flavors: White, Coconut, Coconut Spiced and Banana. The coconut is robust yet easy with a just-cracked-open-coconut character (all natural) and an incredibly smooth mouthfeel. The Coconut Spiced Rum is the new way to spice, where cinnamon, nutmeg and clove meet beach-aged rum and natural coconut for a whole new way to experience the islands. The banana rum tastes like they took your Grandmother’s prize banana pudding and infused it into the highest quality rum. It’s amazing. The white rum, featured hear in my salty kiss cocktail is crystal clear, balanced, and has gentle spice notes. It works well in any of your favorite rum cocktails that call for a light rum. 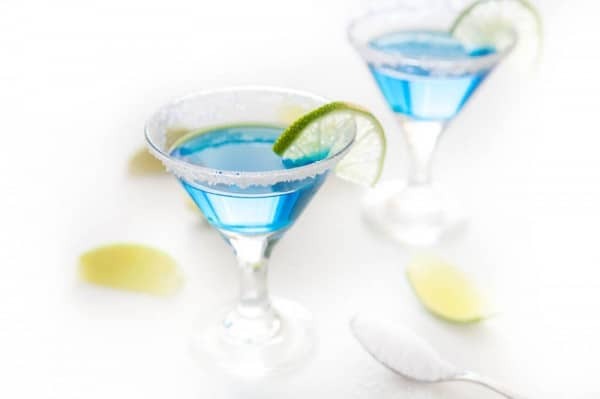 In this cocktail, I’ve paired the rum with Blue Curaçao and lime juice and served it in a salt lined martini glass garnished with a lime wedge. It’s a simple, smooth rum martini you’ll want to make again and again. 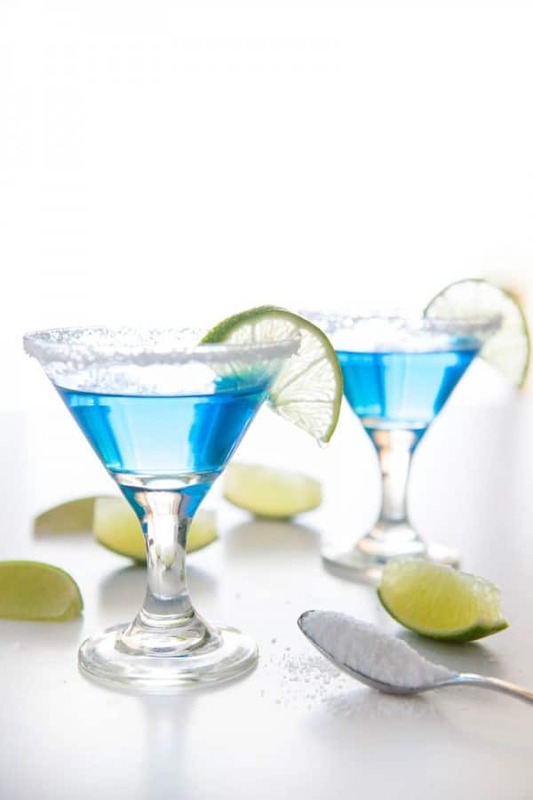 Combine rum, Blue Curaçao and lime juice over ice in a martini shaker. Shake well and pour into martini glass rimmed with lime juice and salt. 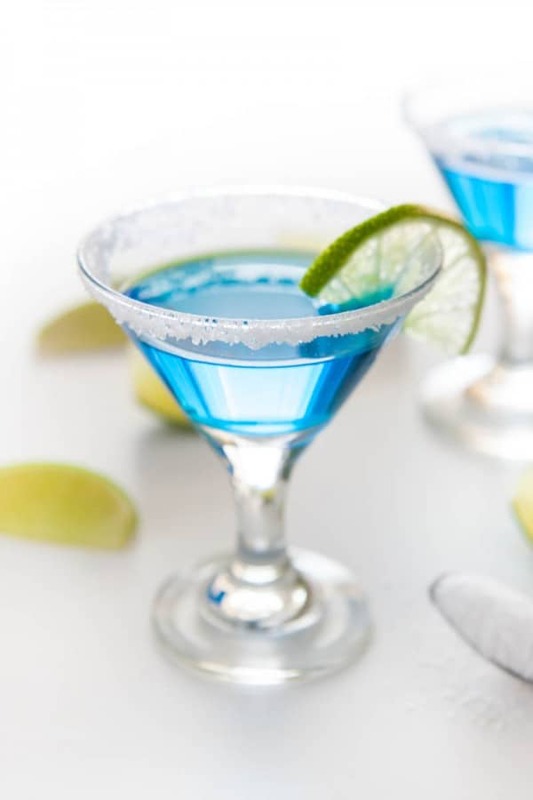 Any sipper with a such pretty blue hue just screams vacation! What a gorgeous cocktail – and it sounds fantastic! This is definitely going to be our next ‘signature’ cocktail at our next party! WOW, this salty kiss cocktail looks so refreshing and delicious for a summer BBQ! Pinned! Ok, I don’t want to drink this. I just want to walk around by the pool, holding it and look chic! but after a while, I’d have to drink it. It sounds too good not to! what a beautiful color and photographs. truly gorgeous! That is one gorgeous cocktail! Cheers. Beautiful cocktail! This perfectly embodies the summertime lush situation I have going on. LOVE IT!.